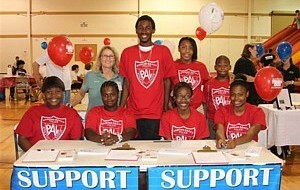 Florida PAL established the Youth Directors Program (YDP) in 1998 after members expressed a need to provide leadership training and a need to involve youth in PAL program decisions. Members of Florida PAL felt it was important that the youth involved in the YDP be properly trained so that they would be able to improve their lives, and the lives of others in their communities. In the YDP special emphasis is placed on community service [required by most high schools for graduation and acceptance into college], making your voice heard and earning your way in life. By empowering youth to make decisions, organize projects, and manage their own organization, the State of Florida Association of Police Athletic/Activities Leagues (SFAPAL) has tread new ground in youth development. The intent is to no longer make decisions without the input of youth the PAL is trying to serve. SFAPAL's goal is to implement a Youth Directors Program in each member chapter. All local member chapters are known as Youth Directors Councils. Qualified representatives were elected on a local level to represent their member chapter at the annual SFAPAL Youth Directors Conference (YDC). Florida PAL provides periodic training to each region to help facilitate the development of the YD Council and assists regional directors with community service projects and regional meetings. The Youth Directors Conference and the local youth directors' councils are a dynamic part of ongoing Police Athletic League programs that aim to encourage and guide our young people. When our youth directors serve their communities, their good deeds are beneficial not only to the people they help, but also the youth directors themselves. When many hands work together, much gets accomplished. That's what the Police Athletic League Youth Directors are finding out as they pool their strengths and talents for their regional projects in their communities. The best part is how the young people feel knowing that their efforts make a difference. Knowing that spending some time cleaning up a park or reading to a sick child makes this a better place to live. Isn't it nice to know that some young people have better things to do than hang out on street corners?